Bisbee history is unbelievably rich and diverse. From progressive women to murderous men, from a Democrat stronghold to the power behind the Bull Moose party. From great wealth and political power to a back seat in state governance, Bisbee has it all. Dozens, hundreds, thousands of stories. You can dig as deep as you want and always find more. Much like its fabulous ore bodies. It has several “founding dates:” The original discoverers filed the first mining claim in the summer of 1877; it got a name and a post office in 1880; and it was incorporated in 1902. Each date is important. Tombstone was a silver-mining camp, and though it was discovered at the same time as Bisbee, it boomed faster and became the county seat when Cochise County was carved out of Pima County in 1881. That left Bisbee with a local jail, for example, that was just a holding cell, and trials for area crimes were held in Tombstone. By the late 1920s, however, Tombstone was shriveling and Bisbee (and Douglas, its smelter city) were on a steady rise, so a vote moved the seat to Bisbee, which led to the Depression-era Courthouse, one of Bisbee’s many architectural and artistic gems. The Depression brought about many other changes, for the better in many ways, to Bisbee’s physical appearance, including yard after yard, by the thousands, of concrete that gave the community much of its permanence. And other assets as well, including changes at its historic ball park and it golf course. During the earliest years of Bisbee history, most of the structures were build in the canyon bottoms, logically, but in the fin de siècle boom, it worked its way up hillsides, much farther up than infrastructure could accommodate, but the remains of that growth remain a visible part of Bisbee’s heritage. The community also made its way downhill, or down canyon, to the southeast, out of the expansive historic district, through an area that has mostly disappeared because of the development of open-pit mines, and on to the remnants of Lowell and to the planned community of Warren. That necessitated a mass-transit system, and by 1908, a trolley system linked the various communities, easing up the need for building up the hills and making the residents mobile for the second time. The railroad, which arrived in Bisbee in 1889, had provided a way for men, at least, to hop on board like hobos and “ride the rods” to many points around the extended community. Bisbee history includes stories of many immigrants who made it big, including Joe Muheim, from Switzerland, whose enterprises included brewing, banking and mining, and who left the community a luxurious home which would become a museum. And the three Brophy brothers, Irish immigrants who dominated parts of the commercial district, leaving a state-wide legacy. The most cosmopolitan city in the territory, and in the early days of statehood as well, had thousands of contributors to its success, men and women from all parts of the nation and Europe, who worked long and hard to better themselves and their community. Some had respectable positions in the town; others less so, though often more colorful. In short, Bisbee was a miniature metropolis, with all the aspects of life that could be found in a San Francisco or a Denver. The economic history of Bisbee is all about copper, though huge amounts of gold, silver, lead and zinc also came from the mines. Many companies operated in the district, most relatively unknown, though there were the few that were so successful that they made up for the rest many, many times over. The first company of moment was the one whose name became imprinted in a number of institutions around the district — Copper Queen Mining Co. In the mid-1880s, the time of the camp’s first “boom,” it merged with the New York firm, Atlanta Mining Co., into Copper Queen Consolidated Mining Co., the direct predecessor of Phelps Dodge Corp.
Later would come several firms, with cross ownership, that would be merged in the early years of the 20th century, into the Calumet & Arizona Mining Co., or C&A, which was responsible for the development of the Warren townsite. The interests of the Shattuck company, and the Denn company, later the Shattuck-Denn, would provide a third major entity in the early years of the 20th century. The first two of these firms, the CQ and the C&A, also were responsible for the creation of another Cochise County city, Douglas (named for James), which would rival Bisbee for political dominance (athletic, as well), through much of the 20th century. Douglas was the smelting and railroad center for the firms. By the 1950s, virtually all of the mining properties in the Bisbee district (technically the Warren Mining District and outside city limits) had come into the ownership of Phelps Dodge. That firm, in turn, was acquired in the early part of the 21st century by Freeport-McMoRan Copper & Gold. The commercial center of the metropolis was first the Castenada & Goldwater store, located on Main Street between the early 1880s and the middle of that decade, when it burned the second time and Joe Goldwater (Barry’s great-uncle) gave up and left town. It was the de facto bank, two decades before the town had an actual institution of that kind, and thus had the safe where citizens kept their valuables and the mining company its payroll. It was the scene of the “Bisbee massacre” in 1883, an event that would make headlines around the West, would take a dozen lives and would result in the first legal hanging in the new county of Cochise. Once that store left, the Copper Queen company purchased an existing store and turned it into the “company store,” which was just the opposite of what Tennessee Ernie Ford sang about. It was created to make sure there was a source of reasonably priced merchandise in Bisbee, rather than in far-away Tombstone. It grew continually and was still serving the miners when the mines shut down in 1975. In 1902, the company decided the town needed a first-rate hotel to serve visitors and business clients, and constructed the Copper Queen Hotel. Its restaurant was compared to Delmonico’s Restaurant in New York City, the nation’s first fine-dining establishment. After its advent, the hotel hosted all events of moment that took place in Bisbee. The year it opened, for example, a committee of U.S. Senators came through Bisbee to hear testimony about whether Arizona should become a state. It ensconced itself at the Queen, and witnesses came by to answer its queries. The cultural history of Bisbee might begin with its schools, which were paid for during the early decades by the CQ mining company. Starting with a one-room schoolhouse (1882), this institution grew rapidly as the mines grew, and before long, there were buildings all over the district. By the opening of the 20th century, the mining company turned funding of the schools over to the citizens. At the same time, a city was created, covering much of the population center, known today as “Old Bisbee,” or “Historic Bisbee.” This also gave the citizens more autonomy, and responsibility, in running their own affairs. Self-determination was not without controversy, as would be expected, unlike the paternalism of the mining company. Though well off, the citizens would delay on funding needed infrastructure, such as sewers, and would tackle social issues before concrete issues, as shown by the town’s first ordinance, which made it illegal for women to work in establishments where liquor was sold. But all this provided great headlines to the local newspapers, which got their start in the waning years of the 19th century. In an age when papers took a political stance, Bisbee’s was Democrat, just as the community continues to be today. Coming right up to the smelting works were railroads, taking up all of the area now covered by the large parking lot. There simply was no room for more smelter growth. There also was an ever-increasing social issue. The smelter was polluting the community with sulfur offgasses. Originally, in the upper reaches of the mines, the ores were oxides, or carbonates, and the smelter smoke was carbon dioxide and water vapor. Those ores had been oxidized over eons by percolating rainwater treating them with oxygen. At greater depths reached by mining in the 1890s, the chemical change had not taken place, however, and the original sulfide material gave off sulfur dioxide/trioxide when smelted, which, when mixed with water, created sulfuric acid, a substance detrimental to plants and even moreso to human tissues. The coming of the Calumet & Arizona Mining Co. provide, then, the impetus and the opportunity (the cost to be shared by two major firms) of moving the Copper Queen smelter to Douglas and building the new C&A facility right next door. The Copper Queen-controlled El Paso & Southwestern Railroad was run to the new city 25 miles to the east to haul the ore (downhill) and another rail line was run due north from the copper mines of Nacozari, Sonora, also owned by the Copper Queen interests. C&A built first at Douglas, since that company didn’t have an existing smelter, but Copper Queen followed up quickly, and by 1903, the Bisbee smelter was no longer needed. It would be logical to think that with the smelter gone, so would be a sizeable portion of the work force, and that Bisbee would have shrunk. But for so long, Copper Queen had been finding more and more ore, to the point it could mine everything it wanted, so the new smelter was built much larger, and Bisbee’s mining work force grew quickly to replace the loss of smelter workers. In addition, the C&A was causing the city to grow. Since it needed housing for all of its workers, it caused to be created a townsite development company, which hired an urban architect to lay out the Warren area. The development company put in streets and sewers and sold lots. Many of the community’s wealthy families built homes there to encourage others to choose Warren for their homes, many of which would come from the Sears Craftsman catalog. Because it was far from work and shopping (and entertainment), an interurban streetcar system was built, opening in 1908, making the district effectively much smaller. To encourage ridership that would make the trolley profitable (in retrospect, entirely unnecessary), the firm built a baseball park, today recognized as the oldest remaining park in America. As Bisbee boomed its second time, the Gilded Age (so-named by Mark Twain) was ending and certainly a copper age was in full swing. But American social and political thought were moving in many divergent directions, and that would be seen — and felt — even in the remote Southwest before long. Arizona, a territory since 1863, very much wanted to become a state, but folks back East thought it was too crime ridden, despite its abundance of metallic wealth. Thus was created the Arizona Rangers, given authority over the vast open ranges, but mandated to be based in the town most in need of its services. During its short existence, it had its headquarters in Bisbee, Douglas and Naco, Bisbee’s nearby border crossing. Copper mining was the mainstay of Arizona’s economy, and certainly that of Cochise County, as well as sites just south of the Mexican border, with mines belonging to American firms. With that many mines, and with the social order changing, there was bound to be labor strife. The first such action was at Cananea, Sonora, about 40 miles southwest of Naco, and controlled by William C. Greene, a former cowboy who had fought Wall Street and won, gaining himself a vast empire, mostly south of the border. A strike by workers there in 1906 turned bloody, and today is often called the spark that ignited the Mexican Revolution, which began in 1910. The following year, the Western Federation of Miners went on strike in Bisbee, but that action coincided with a recession in the United States, so the mines were happy to lose a few workers. By the end of the year, the labor action had fizzled, gaining nothing for the union; indeed it gave more credibility to the rival Industrial Workers of the World, which had recently split off from the WFM. Come back soon for more history and photos. 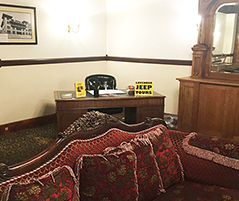 We’re still at the Copper Queen Hotel, but now we have a desk in the lobby, making us easier to find. Where is it cool in Arizona?